This Situation Report is issued by the National Emergency Operation Centre and covers the shift from 0800 to 1600HRS. A Storm Warning remains in force for KABARA, NAMUKA, FULAGA, OGEA, VATOA AND ONO-I-LAU. A Gale Warning remains in force for MOCE, ONEATA, MATUKU, and TOTOYA AND KOMO. The DivEOC East has now directed its focus to the Lau group. The NEOC continues to monitor restoration of essential services and monitors the movement of TC Ula. A press conference was given today at 3pm by the Director NDMO, Mr. Akapusi Tuifagalele. Public advisories continue to be issued to members of the community through the Department of Information. The total number of deaths related to TD07F remains at 3. The number of missing persons related to TD07F now stands at 4. A gale warning remains in force for moce, oneata, matuku, totoya and komo . A strong wind warning remains in force for the rest of the lau group, eastern vitilevu, lomaiviti group, kadavu, taveuni and the nearby smaller islands and eastern vanua levu. Severe tropical cyclone ula centre [968hpa] category 3 was located near 19.8 south 178.5 west or about 110km south-southeast of kabara or about 100km north-northeast of ono-i-lau at 1pm today. The cyclone is moving west-southwest at about 16km/hr and may intensify further. Close to its centre, the cyclone is expected to have average winds of 150km/hr and momentary gusts to 205km/hr. 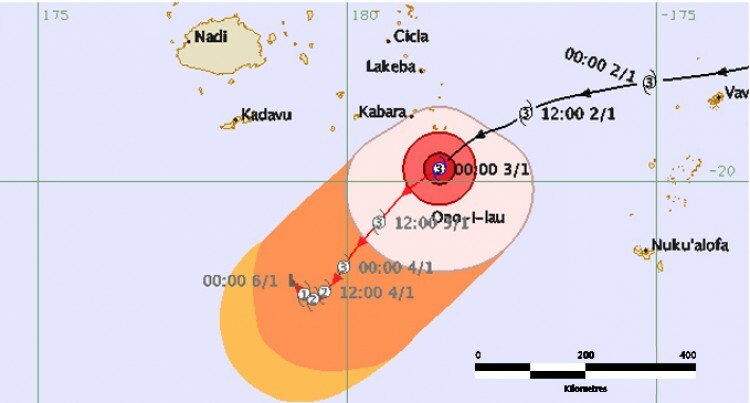 On this track, the cyclone is expected to lie about 150km south of kabara or about 65km northwest of ono-i-lau at 7pm today and about 210km south-southwest of kabara or about 90km west of ono-i-lau at 1am tomorrow morning. Destructive winds may begin several hours before the cyclone centre passes nearby or overhead. For kabara,namuka,fulaga, ogea, vatoa and ono-i-lau: destructive storm force winds with average speed 105km/hr and momentary gust to 155km/hr. Periods of heavy rain and squally thunderstorms. Damaging heavy swells with sea flooding of low lying coastal areas. For moce, oneata, matuku, totoya and komo: damaging gale force winds with speeds of 75km/hr and momentary gusts to 100km/hr. Periods of heavy rain and squally thuinderstorms. Damaging heavy swells with sea flooding of low lying coastal areas. For the rest of the lau group, eastern vitilevu, lomaiviti group, kadavu, taveuni and the nearby smaller islands and eastern vanua levu: strong southeast to southwest winds with an average speed of 45km/hr gusting to 65km/hr. Occasional rain, heavy at times. nautical miles of centre. Storm force winds and very high seas out to about 35 nautical miles from the centre. Gale force and high seas out to about 60 nautical miles in northern semicircle and 100 nautical miles in southern semicircle from the centre . For the rest of Fiji waters: west to southwest winds 20 to 30 knots with gusts to 45 knots. Rough to very rough seas. Moderate to heavy swells. Both fishermen of Volivoli Settlement Ra. Tevita Seru of Dravo Village Tailevu age 10years – swept away by current whilst swimming. DivEOC Eastern continues to coordinate with PA Lau’s office for updates on TC Ula’s movement and developments. Onoilau is experiencing strong winds and rain. Ogea: is experiencing strong winds and rain. Fulaga: is experiencing strong winds and rain. Lakeba,Oneata, Namuka, Komo,Moce and Kabara : are experiencing strong winds and rain. Fiji Police Force, Health, Roads and Education agencies on Vanuabalavu are on standby. A communication line on Vanuabalavu is now open to members of the public on phone 8280892. Fiji Police Force, Health, Roads and Education agencies on Lakeba are on standby. A communication line on Lakeba is now open to members of the public on phone 8280999. The Ono-i-Lau Post Master can be contacted on phone 6030705. Restoration of power supply from Levuka Town to Bureta Village continues. The search for the two missing persons from Volivoli Settlement in Ra continues. PA Ra’s office is coordinating with FRA to restore accessibility of Nakorotubu Road. No adverse weather condition experienced in the Northern Division. All essential services have been restored. No adverse weather condition experienced in the Central Division. Power and water supply are being restored to affected areas. The general public is advised to store enough water for drinking and hygiene purposes and to store it in clean, sealed containers. The Ministry of Education has advised all schools evacuation centres to be on standby for immediate activation. Nabua Primary School remains open as an Evacuation Centre and is accommodating stranded passengers from the Patterson Shipping Services. NEOC is coordinating with the Divisional EOCs and government agencies on the movement of resources and manpower to assist affected areas and services. All operations continue as normal. Tikina Naviti, Yasaswa delivering water. Below is a list of areas without power as at 8.00am on 03/01/16 due to faults in the power system resulting from the Tropical Depression, with tentative restoration timelines. Western division and northern division are all clear. Ovalau Circular Road at Viro Village (Levuka) will remain closed due to crossing approach washout. Ovalau Circular Road at Cawatara Village (Levuka) will remain closed due to land slip. Ovalau Circular Road at Sinuda Village (Levuka) is accessible to 4WD only. Teams are conducting repairs on QVS raw water pumps. Standby raw water pump installed to replace inoperable Korovou raw water pump. Water supply has been partly restored and work is still ongoing. 100mm pipe burst at Waitovu and 100mm main at Toki washed away at the bridge crossing. Repair works continue from yesterday afternoon at Waitovu. Naboro – yet to replace bulk main washed away during current floods. Preparation instructions have been given to all supervisors. Supervisors have also been advised to factor in emergency logistics and rosters in their preparations. The NEOC continues to closely monitor the developments on the restoration of essential services brought by TD07F and continues to monitor the movement of TC Ula. The NEOC will also coordinate manpower and resources with Divisional EOC’s around the country in response to the impacts TC Ula. Public advisories will continue to be issued through the Department of Information. The general public to be updated regularly on developing situation so that they are prepared and also refrain from unnecessary movement, especially for those planning to travel out to sea. Divisional, provincial and district Emergency Operations Centers (EOCs) to continue to be in a state of readiness to ensure availability of essential food items and relief supplies to affected communities. The NEOC stands ready to coordinate damage assessments for TD07F and TC Ula and facilitate the necessary relief and rehabilitation measures required. The NEOC will continue to monitor the developing situation and strive to strengthen its coordination mechanism.